This is a Mambo I built a few years ago out of Owens Corning pink fanfold house insulation foam and some solid construction scrap foam. I covered the foam in paper and Titebond II glue, watered down. Paint was acrylic. 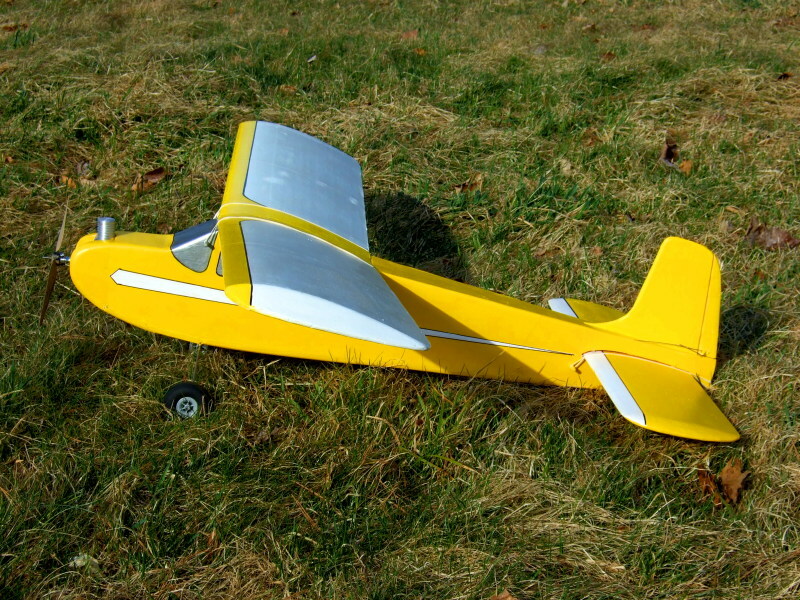 The backstory: when I was a kid I built a balsa kit Mambo one of the first R/C planes I successfully finished as a 14 year old -- planned as an R/C trainer. The original had a single channel Citizenship "MDL" transistorized tone receiver and an Aristocraft escapement. I crashed it first time out, shortly after a more experienced flier handed controls over to me. I spiralled in, and that ended my flying career for about 40 years! A few years ago I decided I wanted to build a Mambo again and finally fly it, only this time in foam with an electric motor. It turned out to be an easy build, and the plane came out much lighter in that construction and with today's R/C gear. So much so, that I needed to add ballast forward. I decided to take a scrap aluminum sprue from my casting hobby and turn it on my homemade lathe to make it look like an engine cylinder -- and that would be the ballast. It flew beautifully first time out -- and in fact didn't seem to want to come down much! This plane will thermal easily. The only real changes I made were to increase the rudder size, and add a narrow half elevator to one side of the horizontal stabilizer. It doesn't need more, and will loop readily with this small control surface. All in all a very gratifying plane to build, very well mannered to fly, and it's always well admired at the flying field. At a round 14 years of age (before I was allowed to drive on public roads) I too had a Mambo as one of my first R/C ships. It I recall correctly it was a mini Mambo with a Cox 0.049 using a Mattel single channel. The way to get a single channel to perform any aerobatics was to trim her for a constant climb. To fly level one needed to keep making turns. To make a loop we put her into a spiral dive to gain speed. a touch of opposite rudder followed by neutralizing* the rudder. With the added speed and up trim she would loop. then at the bottom of the loop with the speed built up apply full rudder and she would roll. then can the long turning climb trying not to stall to gain height and do it all again. I think because of these on off type inputs habits I earned early on is why I'm such a poor RC flier today. *Neutralizing is a odd term as the rudder was always wagging. You hoped the rubber motor lasted longer than the engine run! I see you are very comfortable with foam construction. Is there a trick, or process to getting a nice finish? I know with balsa it is sand, sand and sand with clean sharp sandpaper. I rarely get a presentable finish with my foam ships and be able to keep the weight down. I may need to build a School Girl to remind me of the joys and frustration of single channel flying. Konrad, on something that doesn't mind the weight, covering the model with paper makes finishing with a nice surface easy. 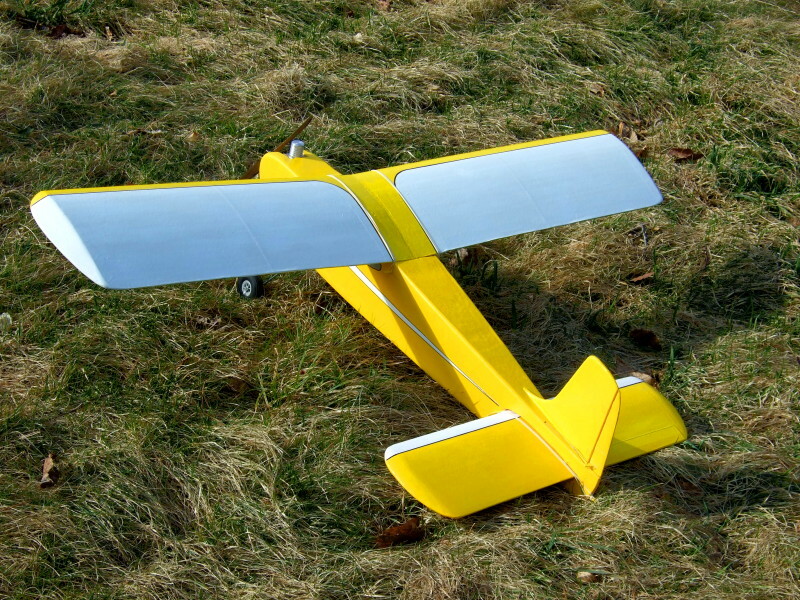 Most people think that my Fomambo (Foamambo, Fauxmambo) is indeed a balsa model, and are surprised to hear it isn't. I say weight loosely because, on older designs like the Mambo, even paper covered, they will come out lighter in foam than they would have when kitted in balsa. The paper makes them extremely tough, and it stiffens up the structure so no spars are needed in wings, and no longerons in a fuselage. It becomes a stressed skin structure, with the foam simply acting as a web. I say stressed skin advisedly. Paper shrinks when drying, and puts tension on the foam. And therefore, you must cover both sides of a wing panel at the same time. My favorite paper was a cheap pulp drawing paper once available at Staples. Now sadly, not. Avoid clay coated high brightness papers -- you want the glue mixture to penetrate. Light weight cheap paper is better. The resin mix I use is watered down Titebond II. I wet the paper using a foam brush, then fold it together to allow the resin to penetrate and slow drying ("book it", as walpaper hangers say) while coating the foam panel. Then I unfold the booked paper and apply, working out the wrinkles and bubbles with the foam brush. The paper will often lift in spots a little at the start of drying, I tamp that back down, but generally full drying will taughten the paper up anyway, just like tissue on a stick model. 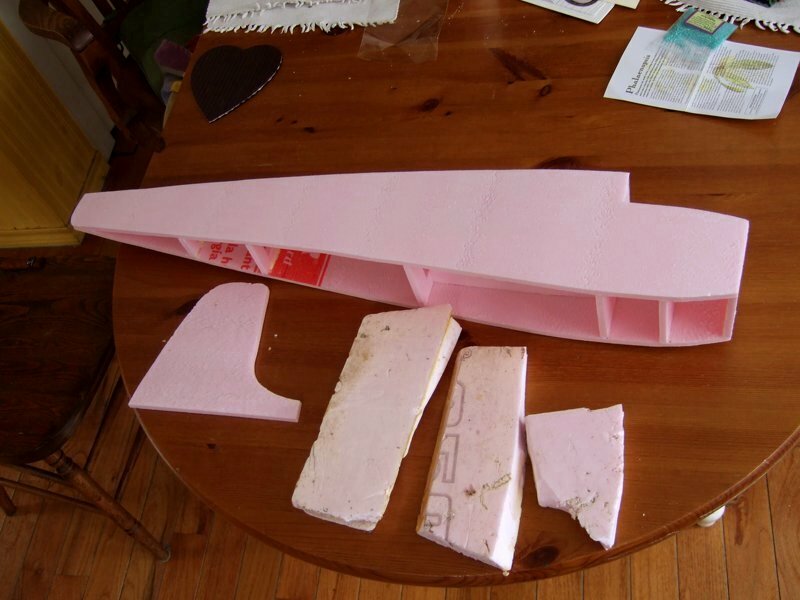 Incidentally I tried using tissue on the bottom of the Mambo fuselage as an experiment instead of paper. No good -- when wetted with glue mix, wrinkled up and tore on the rough sanded foam surface, and dried it wasn't dent resistant as paper is. When I brought the plane home, the dent had even disappeared -- the paper and foam had self-healed, it took careful examination to even see where it had happened. I do achieve a nice finish on unpapered foam in very light weight models, too, but we'll save that for another post. Here's a quick hop around the patch, just a takeoff and landing after corralling someone to hold the camera for it. Thanks for the write up! I had used the "brown paper & glue" finish before, and thought it was a heavy finish. I came to this conclusion by weighing the before and after weight of the model. But if this finish is to be thought of as part of the structure (stress skinned, load bearing) it might make more sense. I'll need to look at the all up weight. For the glue I used the original Titebond as I found Titebond II was a bit gummy making it more difficult to sand. I'll have to reevaluate this. Hi Konrad, brown paper is thick compared with what I use, so it absorbs more glue mix, and will be heavier. I know it is frequently recommended, as is newspaper, and coffee filters. I don't like all of those, for various reasons. A thin white open bond paper is my preference. As far as weight goes, here is a 1 meter Mimi DLG paper covered foam wing I built. It weighed 73 grams, which Frans Bals, the designer, said was "a very good weight" and in line with the lightest solid contest balsa versions -- and mine had been painted solid with a brush, while the standard Mimi's usually just had a light rub with a bit of varnish on the wiping cloth. Paper is heavy, but foam is light. Combined properly, they can produce a commensurate result. Thanks, I understood what you said about getting paper specifically for the purpose of covering. I think it is called light news print. I'm sure somebody in the paper mill industry will be able to correctly call out the material you found at Staples. Yep the use of brown wrapping paper was heavy. Worse was the reuse of grocery paper bags. As is typical the devil is in the details! Exactly, Konrad, everything is in the details. I think the type of paper I used to use is called pulp paper. Seems the industry has mixed terms, because some "newsprint" paper I've seen, used for coarse wrapping and packaging filler seems different -- is kind of oatmeal colored with flecks of impurities in it. I wouldn't use that. Anyway, now I just use some light weight 18" x 12" "drawing paper I got from Amazon -- it seems to come in different weights (pound stock) and I got some that was pretty light. Harder finish than the stuff I used to use and whiter, but not excessively so, or clay filled. Seems to work okay, though a little less tear resistant when wet, so I have to be more careful. btw.. unrelated, but maybe of interest...a big problem with thin foam wings, is buckling on the upper surface in an accident. Glue saturated paper matrix on that surface greatly increases the wing's resistance to buckling. Many people in the R/C foamie world don't understand buckling failure. They often build foam wings and add packaging tape to the underside of the wing. That constrains the lower surface with a higher tensile strength strap but does nothing to prevent the increased buckling loads of the upper surface that they've created. Tape is poor in compressive resistance, so adding it to the top of a wing doesn't do much, except add weight. The buckling problem is seen most frequently in a thin wing. A thicker foil has more compressive resistance at the top. Likewise, using DollarTree foam board with the paper on, as others do, doesn't do much more for the upper surface. There is no glue saturation of the paper. It is also attached to the foam core by heat pressing only. Initial stiffness of a panel seems good, but the upper surface can buckle easily if the wing is bent. The paper has little compressive strength on its own. I mention this because there's a big difference between paper covered foamcore board, and covering with glue saturated paper. Glue saturated paper has a comparatively high compressive strength, and the bond to the foam is solid, unlike tape's contact adhesive so the wing resists buckling to a far greater extent than any of these other reinforcements. When a glue saturated paper covered wing breaks, it's a tensile break on the lower surface, and happens at a much higher overall load than the buckling failure with other methods. The break is usually very clean, unlike the ruptured internal foam structure in a buckle, and is easily repaired with 5 minute epoxy, and a strip of paper over. Anyway, those are my thoughts after observing the results of much destructive testing! Brings back fond memories, Konrad. My Minnie Mambo I built in the late 1970's, used a similar Ace Pulse Commander with Adams Stomper actuator but with KRD quick blip sequential throttle, and a then new Cox .049 R/C Bee engine. Extended tank gave me about 4 minutes flight. Quick blip throttle was a single push button. Each press toggled engine throttle to next position. I had to drill a hole with less travel on the sequential servo wheel to match the throws of the Cox muffled exhaust throttle ring. Since an exhaust choke throttle is not linear, I obtained near linear operation with it giving me 1/3rd opening on forward pushrod movement for half throttle, full throttle half way, and with only the idle notch showing on the back stroke. It worked really well. My engine set up went from HIGH (half throttle) to MED (full throttle) to LOW (idle). In essence it gave me the reverse of a standard RC engine setup as you'd have with the larger carburetted engines, mine became LOW - MED - HIGH. The R/C Bee had a tad more power than a Babe Bee, more like a Golden Bee. My Minnie could do 2 loops from several spirals in dive (2nd loop wasn't as round but still recognizable). I flew that set up so much that I wore out the piston/liner, was on my second set when I finally Figure-9'd it from about 100 feet up. I think if you were to build a larger rudder only with throttle, you'd probably make that RO fly so well, the other flyers would be scratching their heads, "Howin'ell did he do that with perfect control? If you add throttle, will make it even more thrilling. Modern radios will add fun, you can bump the size of that engine to a .09, fly half throttle most the time (will be around .049 like) then crank in more power and really go wild. Not off topic at all, George. I enjoyed reading it. Funny thing, I had the rudder-only experience much later -- when I first returned to R/C about ten years ago, through the little $20 AirHogs twin planes. Well they were not technically rudder only, since they didn't have a moveable rudder, but they were tiny twins with differential throttle, and no control surfaces whatever. But you handled them the same way. You could build up speed by doing a spiral dive, and control altitude indoors the same way. They were kinda ugly little toy planes with stickers all over them, and about 50 feet of range, but they were fun once you "tuned" them, and there were all kinds of mods, including transmitter mods, to make them work better. I'll have to fly the Mambo hands off the elevator. I'm sure the time spent flying with the AirHogs twins will reassert, and I don't think I'll have any trouble using that plane as it was originally intended in a big field. That might be fun. If I was really courageous I could program my transmitter to blank out elevator if I throw one of the option switches, and I could even program in bang-bang rudder if I was up for the thrill of old time blipping. My transmitter is a modified Deviation Tx -- I've already added toggle switches, I suppose I could drill another hole and add a pushbutton for rudder conrol to really travel back in time! The combat flyers use christmas wrapping paper to cover the foam leading edge. An alternative might be doctors exam table paper, it is like the old time silkspan and is really cheap. I have not used it over foam but have covered some free flight structure and for that it works well. Thanks Faif2d. For the Mambo and other foam coverage I like a thin conventional white paper that absorbs the glue water mix and makes a composite matrix. That Christmas paper looks shiny in the photo, which would probably mean it is only glued on the under surface, since it looks like coated paper. They don't absorb well, and are quite heavy, actually. Of course hard to tell from a photo. I do have real Silkspan, btw, but I like it better for its original purpose covering open balsa structures than I do with glue/water laminating on foam. Same thing for tissue. There actually isn't enough fiber in those two for me, and it ends up resin rich. That means denser and weaker. I have tried quit a few experiments laminating different papers over the years (a few other types mentioned in my 4th post above), and I'm pretty well settled on my current paper choice. But nice to see what others are doing with combat leading edges anyway! If I'm going to put a structural skin on foam, I prefer to use the polyurethane glue, drywall joint tape and spackle method that the slope glider guys use on their foamies, but it does require wing core beds during the curing phase. It comes out incredibly stiff and tough for a foam wing. The glue fuses with the foam to form the resistance to compression and the fiberglass strands in the joint tape do all of the tension work, as well as adding resistance to twisting forces if you apply it at a 45 degree angle to the spar line. I have a 60" Le Fish with a pretty high aspect ratio and you'd never believe that it's a foam wing with not a lot of spar glued into it. That sounds interesting VictorY, and a 60" wing slope glider probably won't mind the weight of that type of covering. The Mambo wouldn't probably mind either being a non-critical powered design. Where it gets critical might be a 24-36" span thermal glider with a 14" to 3/8" thick wing. I mention those because my points above about the need for buckling resistance had that type and size range of wing in mind. I like gliders in that size range -- the 1 meter Mimi, the 36" Termite, the 36" Marske XM1d, and the 24" KFerret I built with a PW1211 foil. PU and glass joint tape reinforcement will have less compressive resistance, gram for gram, than Titebond and paper, as a guess. Though I can't say that for sure since I've never tried it. Again, the small difference is probably not a consideration for larger motor planes or a continuous supply of slope lift. Personally I like working with inexpensive, water cleanup, easy to find covering materials. Paper and Titebond II work wonderfully for everything I've tried so far over the last 7 years. I've never needed or used a spar or other internal reinforcement in a paper covered foam wing -- one of the reasons, in fact I build that way. 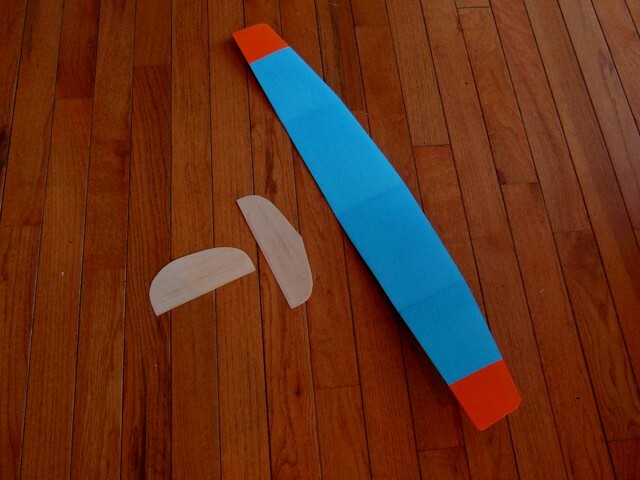 The AUW's of types of planes I build are generally lower than the similar foam planes of others I've seen online. Not always of course! And to each his own -- a successful plane is always admirable no matter what materials were used, in my opinion. Forgot to mention the ease of finishing of paper covered foam. It basically solves all the problems of rough foam finish. If you use white paper you have a smooth white, resin filled, non-porous surface ready to paint right after covering. This means no need for filler/spackle compound. And for light relatively transparent paint colors like yellow, orange, red, white and light colors, you also don't need a white undercoat. No filler and no undercoat saves total finish weight, which, besides reducing the AUW, also assists with CG location. Paint always adds weight aft, every coat. That's because the majority of the surface area of a conventional plane is behind the planned CG location.